Once again the desert sands caused problems for nearly all competitors in all categories. 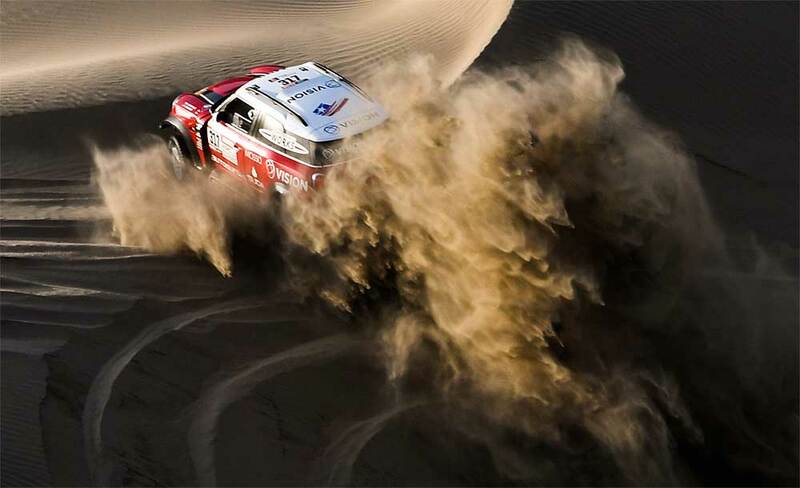 Right from the outset the leading group of cars hit trouble in the deep sand and dunes of the Tanaca region. However, despite the conditions, all five-crews of the Mini Family completed SS05, two inside the top ten. Highest placed Mini crew was Orlando Terranova and co-driver Bernardo Graue who finished in 6th position after starting from 20th. This result means the Argentinians and their 4x4-Mini are now placed just outside of the overall top ten classification in 12th place. Fellow Mini-Buggy crew Yazeed Al Rajhi / Timo Gottschalk started at an incredible pace to complete the first section of SS05 as leaders. 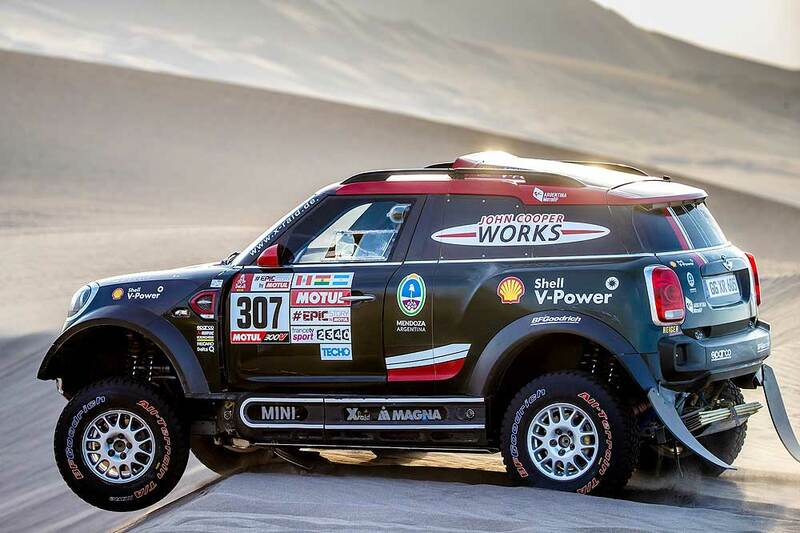 But later, near to the end of the stage, Al Rajhi opted to take a track on the shoreline of the Pacific Ocean and was hit by a freak wave that forced their Mini into the water. Fortunately, the crew of Garafulic / Palmeiro towed them back onto the beach. More Mini Family assistance came with Hirvonen / Schulz then towing them to the end of the special stage. Jakub Przygonski and Tom Colsoul were once again in the thick of the action. As the dust settled after crossing the SS05 finish point, the 4x4 Mini crew were classed 10th in stage and have now moved up to eighth on the overall Dakar leader board. "We got stuck inside the first section," said the Pole. "It was very difficult to get out and spent more than 30 minutes to get free. The other sections were much better!" Boris Garafulic and co-driver Filipe Palmeiro were also victims of deep sand and they too got stuck, but eventually broke free to complete the stage in 12th. They are now 28th overall. Mikko Hirvonen and Andreas Schulz did not have any good luck. Hirvonen hurt his neck after a severe drop from the top of a dune, which forced him to drive with caution. The effect of driving at a reduced pace meant getting stuck several times. "What can I say? I had to come out of the dunes in first gear and by doing this we got stuck two or three times. It was disastrous."